Also known as Buzzard, carrion crow, John Crow, red-necked buzzard, turkey buzzard. What does it mean? "Purifying vulture" Cathartes, meaning "purifier," comes from the Greek word kathartes. This is supposedly a reference to the turkey vulture's habit of eating carrion and thus "purifying" the countryside. Aura is a Latinized South American name for the turkey vulture. Why is it called a "turkey" vulture? The turkey vulture got its name from the common Turkey (as in Thanksgiving), because of the likeness to the common Turkey's featherless and reddish head. The word "vulture" comes from the Latin word, vulturus, meaning "tearer," which in turn comes from another latin word vuellere meaning "to pluck or tear at." This is a reference to the way in which the vulture rips and eats its food (Limburg 1975). Where are they located? How many subspecies are there? There are six subspecies of turkey vultures in the world, including three in North America. C. a. septentrionalis is found in the eastern United States and west into Minnesota, Kansas, Oklahoma, and eastern Texas. C. a. meridionalis breeds mostly west of the above subspecies and down into Baja California, excluding the lower Colorado River valley. C. a. aura is found in the lower Colorado River valley, including most of Arizona, and in southern New Mexico and Texas (Palmer 1988a). Usually in open, rural, lowland areas, but may be seen in a variety of habitats throughout North America (Palmer 1988a). Turkey vultures have a dark brown body with a red head and white-tipped bill. The head is small in comparison to the rest of the body. Males and females are similar in size and weight. They are between 25 and 32 inches in length, up to 72 inches in wingspread, and between 3 to 4 pounds in weight (Palmer 1988a). Little data are available. 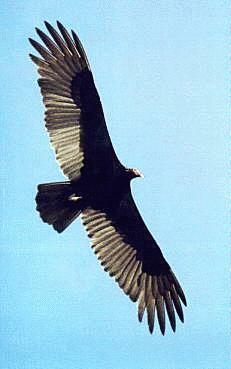 One study found that almost one-fifth of all adult turkey vultures die each year (Palmer 1988a). The longest recorded lifespan of one individual was 16 years, 10 months (Clapp et al 1982). Some recorded flight speeds were 15 miles per hour (Wood 1933) and 34 miles per hour (Broun and Goodwin 1943). Essentially, any available carrion (dead animal flesh) and other parts of dead mammals, birds, fish, and amphibians. Although they eat decaying flesh, they seem to prefer fresh meat. They have also been known to eat live animals. For example, young or dying mammals and birds. When carrion is scarce, they have also been known to eat vegetable matter. Two separate studies recorded turkey vultures eating pumpkins and coconuts (Palmer 1988a), repectively. Are there any other WWW resources on Turkey Vultures? Interesting notes: Turkey vultures have a highly developed sense of smell, something most birds don't have, including other vulture species. They often depend on the odors given off by decaying flesh for locating food (Stager 1964). They have weak claws and usually cannot carry anything in them while flying, but they are capable of carrying small amounts of food in their beaks over short distances (Palmer 1988a). Interesting studies and observations have been made regarding the turkey vulture's sense of smell, in fact, a debate on this topic lasted over a century. Even today, there is still some argument on the subject (see Smith and Paselk 1986). Some researchers thought turkey vultures relied on vision (which they do, to some extent) and/or hearing. One researcher even thought they used an "occult" sense to locate food (Stager 1964). Two separate studies, however, seem to indicate that smell is the preferred mechanism for finding food. In both studies researchers hid decaying flesh, only to have turkey vultures fly right to the hidden meat (Stager 1964; Snyder and Snyder 1991). Other interesting evidence of the turkey vulture's ability to smell comes to us, of all places, from the natural gas industry. 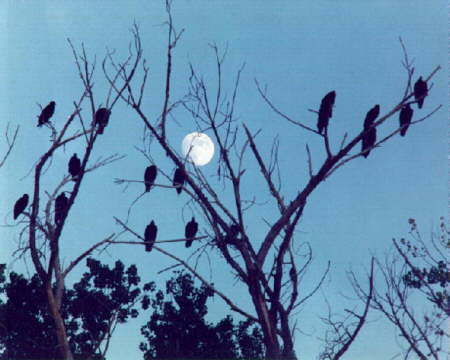 A retired engineer for Union Oil stated his company used turkey vultures to find gas leaks. Natural gas has no odor, but a substance is added to the gas so that leaks can be detected in pipelines, stoves, or furnaces. This substance, called ethyl mercaptan, is one of the chemicals emitted from carrion and thus attracts turkey vultures. Union Oil Engineers were sometimes able to find pipeline leaks by looking for turkey vultures circling above the gas lines (Stager 1964). While higher-tech methods are usually used these days to locate such leaks, some animals are still utilized (see the "Interesting notes" section under Coyote). When turkey vultures are hot they often excrete on their legs to cool themselves. Gross, but effective. Another way in which they "thermoregulate" (control their body temperature) is to spread their wings. Their spread wings act as heat exchangers, dissipating heat when they are hot (Arad 1989). Wingspan 6 ft. length 27 in. Brownish/black body, the featherless head is black in immature birds, red in adults. Wings are held in a V when soaring unlike eagles which hold their wings straight out. Southern Canada through South America. In Minnesota it nests along the St. Croix, Mississippi and associated river valleys, as well as in the north central part of the state. It migrates to the southern U.S. in the winter. Open country, roosts in large congregations in secluded woods. Usually on the ground under cover, sometimes in caves. Lays 2 eggs. 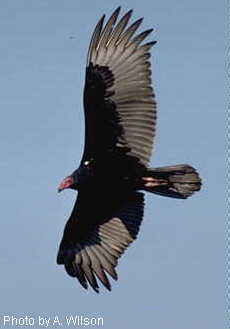 Turkey Vulture are carrion feeders which they locate by vision or possibly by smell. They are often seen feeding in groups on large items but will eat almost anything. The Turkey Vulture is not a common patient, nor a popular one. In spite of haveing weak feet vultures have sharp beaks and will regurgitate their last meal as a defense mechanism. Considered common in its range, this bird is afforded no special conservation status.